The Project Connect roll out was excellent! I could not have asked for a better week, and walked around all day each day telling everyone so then knocking on wood hoping not to jinx it. Turns out, I didn’t need to knock on wood at all. What I needed to do was to pound fists with all of you! As I thought back on each day, I realized how many of you stepped up or came through in moments when it really mattered. That made all the difference between a successful roll out and a disastrous front page story. It wasn’t just one big “save” that got us through (although Melissa Corey is certainly qualified there), but it was all the small but significant efforts from each of you that made our roll out work so well. From helping each other register machines to helping reset the gym after each parent presentation, our staff continues to pull together in a way that chokes me up even now. I am so proud and so appreciative of who we are and the team we have become. Last week we hosted the opening night of our school store. A huge thanks goes out to Ronnie Knight and Jenny Moore for bring it from an interesting idea to an amazing actuality. I hope you have had a chance to see it . It’s crazy cool. 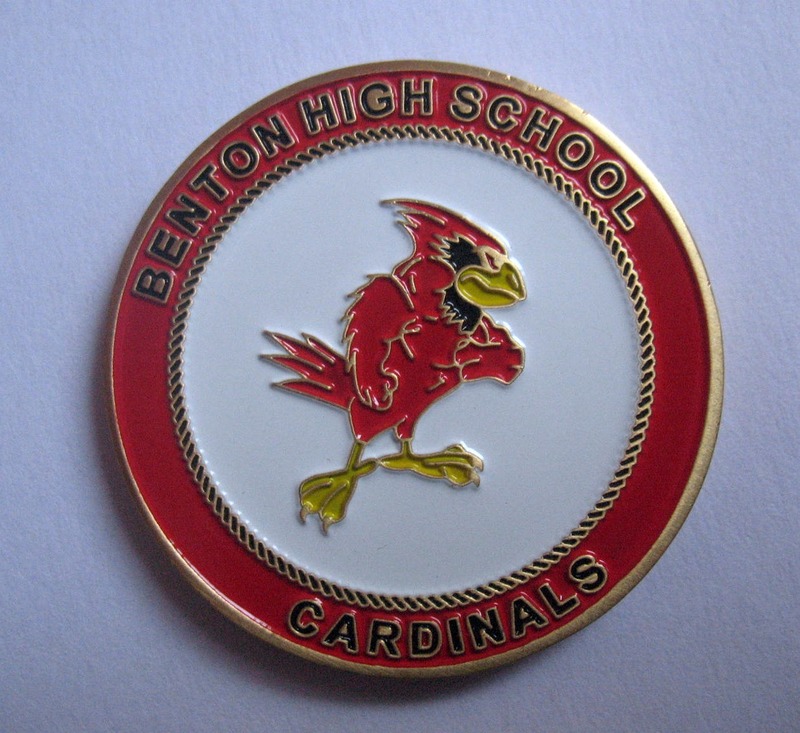 One particular item for sale is close to my heart – it’s the Benton High School challenge coin (based from the military tradition) that you see represented in the photos on this page. 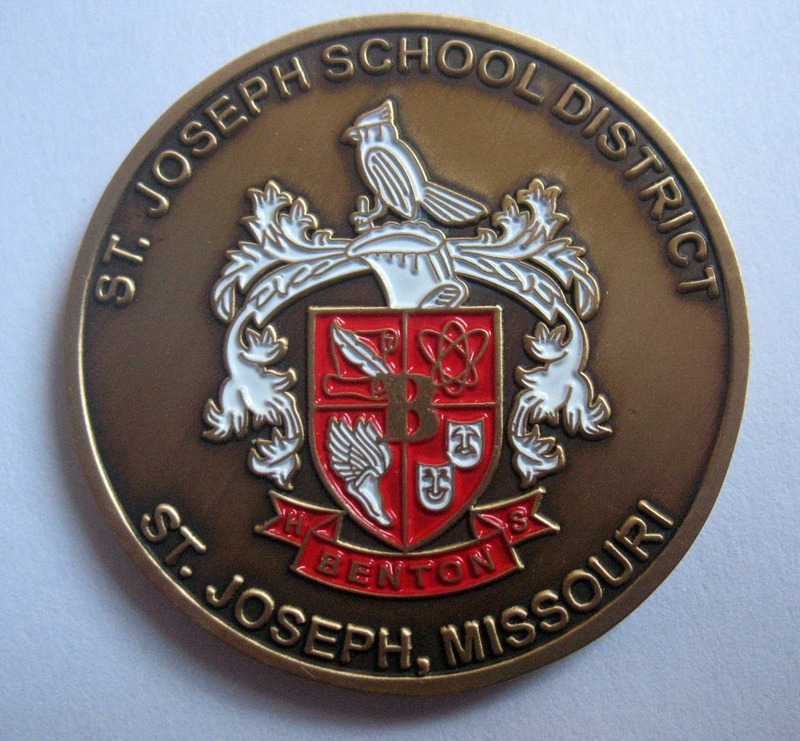 I want to encourage everyone to purchase a coin for $5 and in the next few months consider giving it a student who is excellent for you. Send it with a note. Give it to that child to show you care and you want to reward the excellence. It’s a great way to challenge others to be excellent too. I hope it is our new tradition. This upcoming week presents several challenges – the largest being how to sustain the greatness we achieved from our roll out week. This week is the real test when the students get to take the computers home…and bring them back because they need them to learn in your classroom. We must also monitor which computers can go home and which need to stay in the office. Look for that email to come out by CAMP Monday. 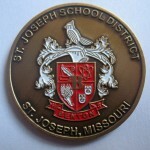 I will be offering parent meetings as soon as Tuesday for our families who were not able to make a meeting last week. Remember, there is no substitute for a parent meeting, so make sure you work through expectations for your class work with students who may not be able to take a computer home. Tuesday in CAMP we will have our student ACT meeting. That list will also be emailed to you. We will be swapping our JEPD and Dept PD days this month due to early opportunities and needs. Wednesday we are offering instruction on EduBlogs Campus – a newly acquired opportunity from the district. This is a full day PD, and we will provide the sub for you. If you are interested in working with Sean Nash on Wednesday, email me immediately. The spots for this professional development are limited. This would be highly recommended for any departments focusing on writing in their data teams work. Thursday is job embedded professional development on Limelight – a district purchased tool that helps you facilitate assignments and assessments as well as track the data from both. Bob Nash will deliver this instruction. Finally, Friday we are going to have to reschedule the Academic Pep Assembly. Look for the date to be in the next few weeks. And it’s going to be a great few weeks (and months) and before you know it we will be graduating our 2012 Seniors. I’m glad we’re doing it together. This entry was posted in Uncategorized by stilliamlearning. Bookmark the permalink. What a fun week it was… I immensely enjoyed walking through the halls and seeing our students equipped with some rather game-changing tools (laptops) and opportunities (the ability to take them home and essentially have agency over this tool in a very real way.) It was very gratifying to see something we’ve worked so hard on… finally reach a very concrete level. And you’re right. It is just that. It is a level. A plateau. Getting to the next level will take risk-taking, individual learning, collaboration, and solid reflection. Know that I am just an email away from working with individuals and teams as small as two… or as large as a department… to help maximize the tools we now share in common as a learning community. It’s also very cool to see staff doing work with Limelight. To me, that is a big step… each of us as individuals getting really smart at what matters to us most at a given moment… and then turning around and offering those experiences for all of us to share. …the core of what will one day become a more powerful student-led conference experience between students, teachers, and parents. Of all of the tools now at our disposal, to me, this one has the potential to be the core tool to make our learning goals happen as we move forward. I’m looking forward to getting a group of teachers together who want to get in the game with the most powerful online blogging tools available for learners. See you on Wednesday, and congratulations on this next step. It was no small one for sure.